Following reports that President Donald Trump’s lawyer dangled pardons for two key defendants in the Russia probe, the biggest question is: was the lawyer acting on his own? Or was it with the knowledge, and possibly at the direction of, the president? Legal experts said it was unusual for the lawyer, John Dowd, to even reportedly broach the subject of a presidential pardon in his role as Trump’s personal lawyer. They added that it’s highly unlikely, and even “unimaginable,” that Dowd would have acted without Trump’s knowledge on an issue like the president’s pardon power. One former federal prosecutor also pointed out that while issuing a pardon may not rise to the level of obstruction of justice, dangling one might. The revelation this week that President Donald Trump’s lead defence lawyer may have offered pardons to two key witnesses in the Russia probe raises significant questions. What was the motive behind the alleged offer? What was the response, if any? And most importantly: was the lawyer acting of his own accord? Or was it with the knowledge, and possibly at the direction of, the president? John Dowd resigned last week as Trump’s primary defence attorney. Until his departure, Dowd was the main point of contact between Trump and the special counsel Robert Mueller. Following Dowd’s resignation, attorney Jay Sekulow took over as the primary liaison between Trump and Mueller. Dowd’s name resurfaced when The New York Times reported on Wednesday that he dangled the possibility of a presidential pardon to former national security adviser Michael Flynn and former campaign chairman Paul Manafort last year, as Mueller was closing in on both men. The Washington Post followed up with its own story confirming the detail shortly after. Flynn pleaded guilty in December to one count of lying to investigators about his Russia contacts. Manafort has pleaded not guilty to dozens of charges related to tax and bank fraud, money laundering, and conspiracy against the US. Dowd told The Times and The Post he did not discuss pardons with Flynn’s or Manafort’s lawyers. Sekulow and White House counsel Ty Cobb also said they had no knowledge of any such conversations. Neither The Times nor The Post were able to confirm whether Dowd made the alleged offer with Trump’s knowledge. But legal experts said in interviews this week that not only was it unlikely that Dowd acted without some level of approval from the president, but that it was unusual for him to broach the subject at all in his capacity as Trump’s personal lawyer. “This isn’t typical at all, and there’s little precedent for this,” Cornell Law School vice dean Jens David Ohlin said in reference to Dowd’s reported offers. Pardons are usually handled through a rigorous process that begins at the Department of Justice. The DOJ performs a thorough review and sends a file with a recommendation to the White House. That file is then reviewed by the White House Counsel’s Office beofre landing on the president’s desk for a final decision. Alex Whiting, a former federal prosecutor who is now a professor at Harvard Law School, said it was “unimaginable” that Dowd would have acted without the president’s knowledge. Trump has touted his pardon power in the past and once reportedly asked aides whether he could pardon himself. He also characterises the Russia investigation as a politically motivated “witch hunt” and often suggests that the case against his associates is flimsy and lacks merit. Manafort has mounted an aggressive defence against Mueller, arguing that the special counsel overstepped his mandate by charging him with crimes unrelated to the collusion inquiry. Meanwhile, former FBI director James Comey told the Senate Intelligence Committee in June that Trump asked him, one day after Flynn was fired, to let go of the FBI’s investigation into the former national security adviser. 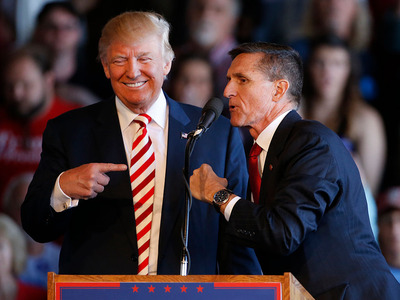 Legal experts said at the time that if Trump knew Flynn had committed a crime when he asked Comey to drop the investigation into him, as Trump’s tweet indicated, it would significantly bolster the obstruction case against him. Shortly after, Dowd claimed responsibility for the tweet. Last weekend, Dowd sent shockwaves through Washington when, for the first time, he publicly called for the Russia investigation to be shut down. He initially said he was acting in his official capacity as Trump’s lawyer, but then walked the claim back. Later that day, Trump blasted out a tweet echoing Dowd’s calls. In the following days, news reports surfaced that Dowd was acting with Trump’s approval when he demanded the investigation be shut down. Most legal experts cautioned against tying reports of Dowd’s alleged offer to Flynn and Manafort to the obstruction-of-justice case Mueller has been building against Trump since last year, arguing that because the president’s power to pardon individuals is near absolute, it likely would not rise to the level of obstruction. But Whiting floated another theory which rests primarily on the offer of a pardon – as opposed to a pardon itself – and how that could bolster the obstruction case against the president, but for very different reasons. When an individual is pardoned, they can no longer plead the Fifth Amendment and may be compelled to testify before a grand jury. “The message of the dangle was sufficiently clear: hang in there and keep fighting (do not cut a deal with the special counsel) because you will be pardoned before you spend a day in jail,” he wrote. Dowd’s alleged conversations with Flynn’s and Manafort’s lawyers took place as Mueller was circling the two men, but before they were formally charged with any crimes. When he was representing Trump, Dowd was the most vocally opposed member of the team to the prospect of a sitdown between the special counsel and his client, who has a history of making misleading and exaggerating claims. According to a source familiar with the matter, Dowd resigned in large part because he was frustrated Trump was not following his advice about declining an interview with Mueller. This week’s revelations add yet another layer to Mueller’s continued requests for a face-to-face interview with the president. The reason, Whiting said Thursday, is that if Dowd was acting with the knowledge or approval of the president, an interview would aid the special counsel in establishing the president’s intent, as well as an ongoing pattern of obstruction.